I would guess from your photo that you are making only the first part of the forward or backward knot. 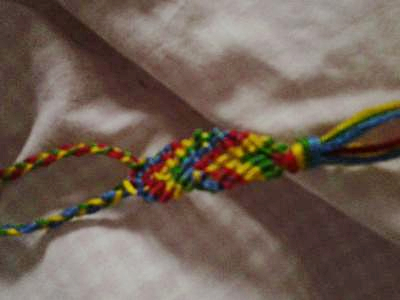 What I mean is that each knot in a friendship bracelet is not really 1 knot. It's 2 "half-knots". I know we generally call the basic knots the "forward knot" or the "backward knot", but really the knots should be called "forward-forward" knot and "backward-backward" knot. It sure would save a lot of confusion. I hope I gave you the right answer!